As more and more blaggers take to the skies and airlines wise-up to increasingly common blag stories, free upgrades are becoming a larger and larger accomplishment for the average customer looking for a free ride at the front. To make matters worse, many new airlines, including easyJet, Ryanair and BMI Baby, have done away with first class altogether, as a means of streamlining their seating process. More established airlines like British Airways and Virgin, have also begun operating stricter seating tier regulations, specifically to prevent blaggers from relying too heavily on chancing last minute upgrades! Asking for a free upgrade on a plane is certainly getting more difficult, but if you are smart enough about when, where and how you do it, you could just about pull it off! You are most likely to be successfully upgraded on oversold flights. If they can’t get you the right seat, agents will try just about anything to get you on the right plane. If you end up being transferred to a later flight because of overbooking it will cost the airline much, much more in the long run than moving you to a spare first class seat. 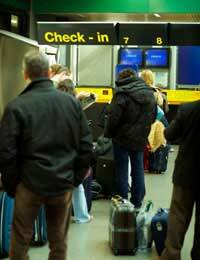 If you are planning to take a trip on a well-known busy service (such as London to Miami in summer) make sure you arrive casually late and join the check-in queue just after the last few conventional “stragglers” turn up. It is important you are the very last passengers to check-in as overbooking is usually just a matter of a handful of extra people. Don’t expect your seats to be taken (you don’t want to give your game away!) but if check-in staff start looking worried, calm them down by talking in a friendly, compassionate manner and suggest a “downgrade, to the front” or similarly light hearted remark! If you’re lucky, you’ll be travelling in comfort for the next few hours! These days, the most valuable person to the blagger is the gate agent, as they control upgrades and know exactly how many seats are free, and how many people have checked-in. Get to the departure lounge early and connect with the agent by building rapor, perhaps discussing the weather or the airline. After hitting it off, a polite suggestion or light hearted remark may prompt staff to offer you an upgrade; if so, excellent! Never ask staff outright for an upgrade, as they will doubtlessly have been asked this question many times before. With enough charm and charisma, you’re chances of success will be much higher. Britain’s best blaggers will have been working on their upgrade from the moment they enter the airport! Spend enough time in restaurants, coffee bars and bookshops at airports and you will doubtlessly bump in to a member of staff that will be serving you later on. Smile, be friendly and try to talk to everyone you meet at the airport. When you get to departures, if they remember that friendly face from before, you’re already halfway there!